A dream comes true for a girl who loves tutus, pointe shoes, and dancing on tiptoe! The girl in this story loves to stretch, to pose, to point her toes, to swirl and twirl and leap! She practices new steps every day. All her efforts are rewarded when one special day, she gets to dance in a performance with her favorite ballerina. The pictures in the book take the reader behind the scenes of the ballet to a practice room, a costume room, and the wings of the stage. At last, the curtain goes up, and the girl and her idol dance. Their tutus swirl together! "Dancing makes me happy!" the little ballerina says. A touching story about dance, passion, effort, and intergenerational mentorship. The five ballet positions are illustrated, and behind-the-scene secrets are revealed. Back matter provides interesting information about point shoes, tutus, and the contents of a ballet bag. The author-illustrator is the mother of a little girl who has grown up to be a professional ballerina with New York City Ballet. This book was inspired by letters Lydia Wellington wrote to dancers she admired, as well as letters she has received from young fans. Every detail in this book is filled with joy and love and is authentic and accurate. A glittery cover makes Dear Ballerina a perfect gift for ballet recitals. A great choice for fans of Angelina Ballerina. Monica Wellington is the author and illustrator of more than forty books for children. As a young child, Monica was introduced to the ballet by her mother and she has loved it ever since. But Monica's dream was always to be an artist. When Monica took her own daughter to the ballet, however, Lydia Wellington immediately began to dream of becoming a ballerina. Now Lydia is a member of New York City Ballet, and Monica continues to attend the ballet with great enthusiasm. 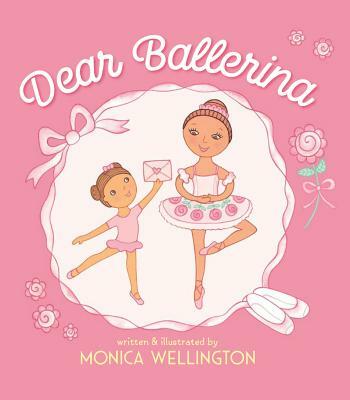 This book is based on letters Lydia once wrote to ballerinas she admired and letters she now receives from young dancers. Monica lives in New York City.